Hello Sunshine! Today I want to talk about an organic whitening skincare product that launched last month, and I'm about to embark on. While I'm not crazy about whitening, I do have my phases, and as the rainy season makes itself felt, so does the girl who wants to lighten her skin. In fact, I just started using a whitening soap a few days ago--but that's an entirely different topic. Anyway, I digress. 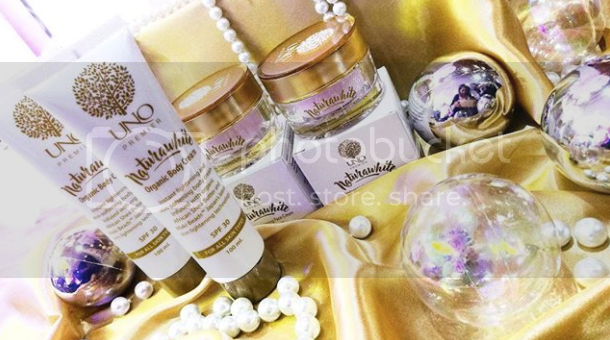 Today I want to share about the freshly launched Uno Premier Naturawhite Lightening Face and Body Cream* I attended their private launch last month, and it was refreshing to see how far natural beauty products have gone. If there's anything you should know about me when it comes to my preferences in beauty, it's that I reach for organic and natural products the most. Not only are natural and organic products kinder to my skin, they're also kinder to the environment. I find natural and organic skincare products to work best for me too--so to discover an instant lightening skincare product that is all organic is a breathe of fresh air for me! I repeat, instant skin lightening that's all organic, possible! At the launch, we were introduce to two products. There's the Naturawhite Organic Body Cream (Php1,670), which comes in sachets btw, and the Naturawhite Organic Face Cream (Php1,770). Both products boasts of providing an instant glow, backed by the latest skincare technology from Japan! Both products are also a blend of ingredients that target to protect, moisturize, and soften the skin, leaving it velvety, silky smooth, matte, and lighter. Here is my face after applying a thin layer of the Naturawhite Face Cream. Instant aura. Used the Naturawhite All-Natural Face Cream with Sunscreen. Kinda blurs the skin, insta-filter na rin! Initial thoughts: wow, it's so pink! It's my first time to see a face cream so baby pink!!! It's with this tinge of pink that's why your face instantly gets a rosy white glow. It had a relatively thick consistency so what I did was dot very light amounts on my face so I don't have to drag skin just to spread the product. But yes, upon application, it will instantly leave a rosy white film that makes your skin appear lighter with just one application. I can imagine it working like a makeup base, especially for those who want to wear very light foundation. On the other hand, the body cream has a powder-scented lotion-like formula. Nothing outstanding, it's just like your ordinary lotion, but what I do love about it is it gets absorbed by the skin super fast. No down-time drying products before dressing up! For more info and to learn about the science behind this product, watch this video. Naturawhite skincare is available from Uno Premier members. Feel free to check out their website for more products to choose from.